The acclaimed Kansas City poet Michelle Boisseau died in 2017. 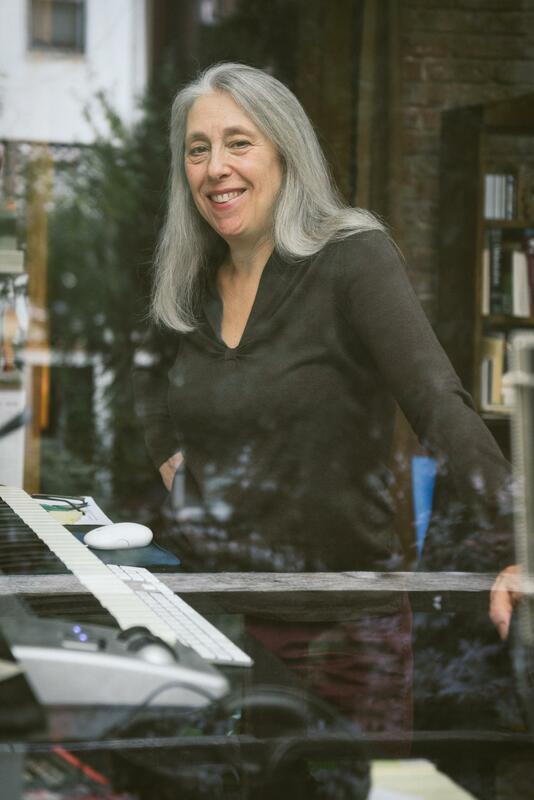 Some of her work has been set to music by the composer Susan Kander. The internationally acclaimed Kansas City poet Michelle Boisseau died of cancer in November 2017. Though people will be able to read her work in books for the imaginable future, two other professional artists have now memorialized her poetry in an entirely different art form. "The idea was to see if somehow Michelle's work could be memorialized in music," says Boisseau's longtime friend, the writer Steve Paul (who is also a member of KCUR's Community Advisory Board). He approached Kansas City soprano Victoria Botero about the idea and sent her a few of Boisseau's poems. She responded quickly. "It was clear she could hear what I heard: that Michelle's strong lyrical voice and dazzling vocabulary could indeed be turned into music," Paul says. Botero, who did not know Boisseau when she was alive, says she was interested in the fact that so many of Boisseau's poems were autobiographical. "It's not navel-gazing philosophy reflecting on, 'Why is the world like this?' so much as it is, 'These things happened to me in my life,'" Botero says. "You feel this immediacy when you read the poems. When she's with someone in a room, you feel like you are in that room there." 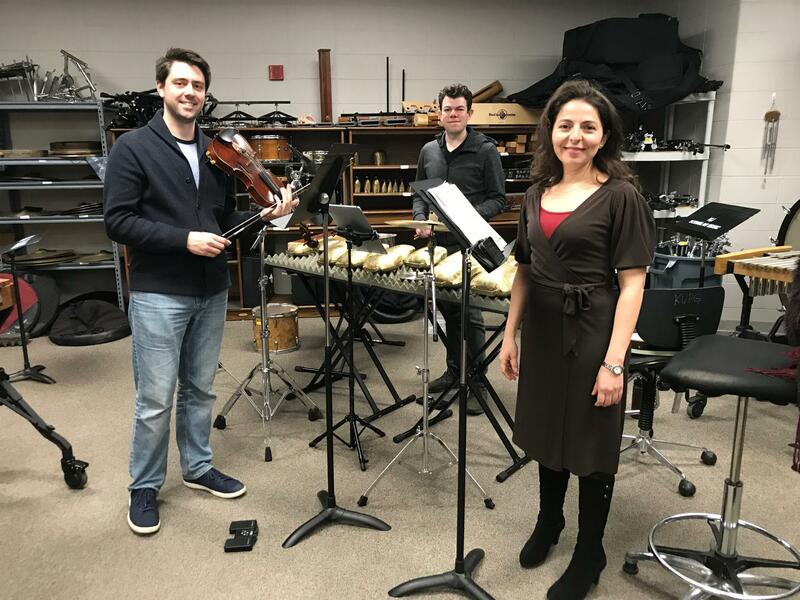 Jacob Ashworth (left), Mike Compitello and Victoria Botero at a rehearsal before performing Susan Kander's "Eavesdropping," a song cycle set to the words of poet Michelle Boisseau. To write music for this work, Botero thought of the composer Susan Kander. Though she has lived in New York City for 40 years, Kander is a Kansas City native. Botero had met her in 2012, when Botero performed in Kander's operatic adaptation of Lois Lowry's novel "The Giver" at the Lyric Opera of Kansas City. Botero had thought the book was an odd choice for an opera, but the audience reaction suggested otherwise. "After every performance, it was just utter silence, and then the applause started, then the lights came up, and the entire audience is bathed in tears," Botero says. "And I thought, 'Maybe I don't know everything. Maybe there's something more to how Susan sets texts.'" Composer Susan Kander set some of Michelle Boisseau's poetry to music. When Botero approached her about working on the Boisseau project, Kander read all of the poet's work before answering. "The challenge was to decide whether or not the poetry wanted music," Kander says. "The words on the page, whether it's prose or poetry, need to start singing to me immediately. If I'm reading them, and the voice that I'm hearing starts to sing, that's the first thing that I'm looking for." Many of the poems sang to Kander; more than she could include in a song cycle that's about 13 minutes. But the ones she chose, she says, told stories and could be related through music. Kander wrote three movements. It's a brief tour through Boisseau's life using four of her poems: three from her 1990 collection "No Private Life," and one from her final publication, "Among the Gorgons." The song cycle is called "Eavesdropping," after a poem from Boisseau's earliest collection. The first movement begins with Boisseau as a child eavesdropping on her mother and the doctor's wife. The poet's family was impoverished, and the doctor's wife suggests putting the children up for adoption. "The music starts with this Sprechstimme, this sung speech, but it goes into really high notes when you hear the doctor's wife say these things," Botero says. "Then there's a stuttering moment, and that's Michelle stuttering because she can't believe that she's hearing that she might be given up for adoption." Kander says "Eavesdropping" will eventually be recorded. Until then, readers can find Boisseau's voice in her five books of poetry. The Music of Susan Kander: "Eavesdropping" and "*DWB* (Driving While Black)," 7:30 p.m., January 25 at The 1900 Building, 1900 Shawnee Mission Parkway, Mission Woods, Kansas 66205. Tickets $15-30. "One thing that a poet needs more than anything else — well, you need a sense of language — but you need people who love you. And I have that," the poet Michelle Boisseau told New Letters on the Air host Angela Elam earlier this year. "I have incredible colleagues, and of course my husband Tom [Stroik], and people who believe in your work. Just keep doing it." The 19th-century English novelist George Eliot was reportedly no great beauty. One contemporary called the author of Middlemarch "exceedingly plain, with her aggressive jaw and her evasive blue eyes." Writer Henry James, who was an admirer, characterized her as "magnificently ugly, deliciously hideous."